Main Street Books, 9780385488372, 352pp. From the #1 New York Times bestselling author of Astrophysics for People in a Hurry comes a follow-up guide to more of the most popular questions about the universe. In this companion volume to Merlin's Tour of the Universe, Neil de Grasse Tyson presents a completely new collection of questions and answers about the cosmos for stargazers of all ages. 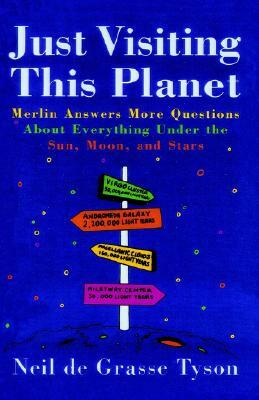 Whether waxing about Earth and its environs, the Sun and its stellar siblings, the world of light, physical laws, or galaxies near and far, Merlin--a fictional visitor from Planet Omniscia and our guide to the universe--is easy to understand, often humorous, and always entertaining. If aliens exploded our moon, what effect would it have on us? What are your thoughts on the theory that a star named Nemesis is circling our solar system and was responsible for killing off the dinosaurs? Is it true that if I leave a container on my roof for a period of time, I can actually collect space particles from outer space? Delightfully illustrated throughout, Just Visiting This Planet is a timeless book for lovers of the universe by one of its brightest lights. Neil deGrasse Tyson is an astrophysicist with the American Museum of Natural History, director of its world-famous Hayden Planetarium, host of the hit radio and TV show StarTalk, and an award-winning author. He lives in New York City.